The Prison-to-College Pipeline movement—born at John Jay College of Criminal Justice in New York City and heralded as an innovative, successful model by the New York Times, PBS, Al Jazeera and many more—creates powerful partnerships between institutions of higher learning and departments of corrections. It is premised on the notion that universities have a powerful role to play in building safer, more just communities and educating the broader public about justice; that incarcerated students bring tremendous intellectual and social gifts to places of learning; and that in order for broad justice change to transpire, a narrative shift about prisons and the people in them must occur. The P2CP is a marriage of education and reentry: education is made the centerpiece of one’s period of incarceration and, upon release, one’s reentry into the community. In its various incarnations, it is at once a university-level education program for incarcerated students, a reentry program for them in collaboration with a unified community, and an awareness-building program that sensitizes the community—academics, future scholars, the public at large and practitioners in a host of disciplines, particularly justice-related fields—to the needs and challenges of those incarcerated and formerly so. Most broadly, it aims to ignite interest in education among those impacted by the criminal justice system. 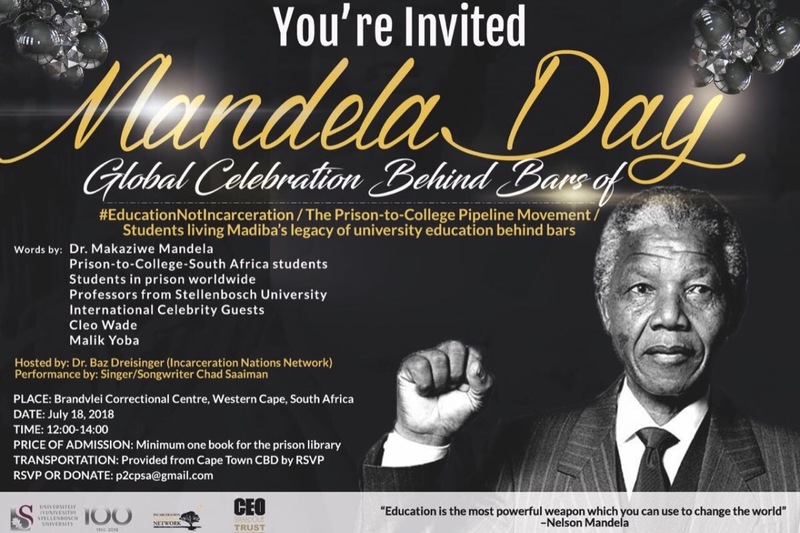 P2CP- South Africa launched its first initiative--Stellenbosch University's Ubuntu Learning Community, inside Brandvlei Prison in the Western Cape--on Mandela’s 100th birthday. But we desperately need your support! Your donations will directly support students turning their lives around in prison in South Africa—and in turn creating safer communities. 1. ...public safety. Those who participate in correctional education are 43 percent less likely to return to prison after release than those who do not. 2. ...workforce development. Those who participate in academic or vocational programs obtain employment at a rate 13 percent higher than those who do not. 3. ...the children, families, and communities to which incarcerated students eventually return. Research has shown that children are more likely to attend university when their parents have done so.